Vitamin K2 is a vital component in supporting bone and heart health, normal blood clotting and reducing the risk of osteoporosis. One of its primary roles is to ensure our calcium intake is delivered into our bones rather than settling within soft tissue. Without enough vitamin K2 calciﬁ cation within the arteries can occur, increasing the risk of heart disease. 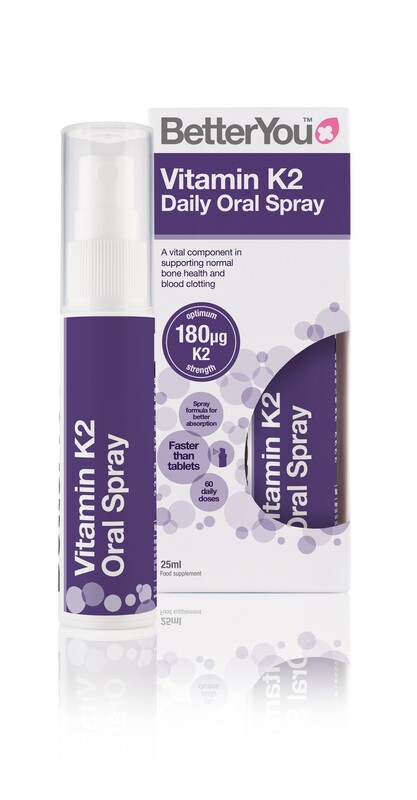 BetterYou vitamin K2 oral spray delivers an optimal level (180ug) of K2. Recent clinical studies suggest that K2 taken at this dosage helps to reduce bone loss and improves cardiovascular health through the reduction of arterial stiﬀ ness. Unlike fermented soy-based sources BetterYou have sourced an exceptionally superior bioavailable and stable form of K2 MK-7, derived from two unique ﬂ ower species, and is a staggering 98% pure. Better absorption than tablets – guaranteed! 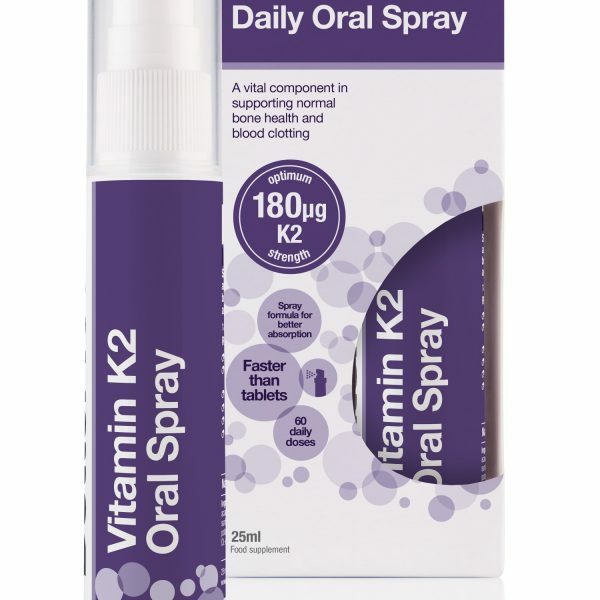 The oral spray is specially formulated to be absorbed directly into the bloodstream, bypassing the digestive system. The spray plume has been designed to coat the inner cheek, delivering tiny droplets for fast and eﬀ ective nutrient absorption, providing a clinically proven uptake, superior to tablets and capsules. Directions On ﬁ rst usage depress the pump 3 times to prime the spray. Spray directly into the mouth against the inner cheek, 3 times daily. Sprays can be taken together or separately. No need to take with water or food. Replace cap after use. Once opened use within 6 months. Ingredients Puriﬁed water, xylitol, acacia gum, menaquinone-7 (vitamin K2), sunﬂower lecithin, citric acid, preservative: potassium sorbate, peppermint oil, DL-α-tocopheryl acetate (vitamin E). Suitable for Suitable for use by customers on a vegan or vegetarian diet. Sugar and gluten free. If you are taking anti-coagulants (blood thinners) consult with your doctor before supplementing.